In the midst of her second Saturn Return and looking wonderful! Though there is some question as to the accuracy of her birth time, I very much like Aquarius Rising for her. I have an Aries niece who has an Aries Sun with Aquarius Rising and she went for the cutting edge look in her teens. Cyndi started experimenting with wild hair colors long before she helped make them a fashion statement in the eighties. The deep appreciation for being true to yourself and expressing your uniqueness shines forth in many of her songs too. Cyndi’s chart is dominated by cardinal mode with six planets in cardinal signs. She has Mars conjoined her Sun in Cancer, Uranus in Cancer and Mercury in Cancer. Her Moon in Scorpio adds more water giving her a great deal of sensitivity to nuance and awareness of emotional atmosphere. There is little doubt this woman is ambitious and a self-starter . . . Sun conjunct Mars will do that, especially backed up by more cardinal energy. Uranus, ruler of her Ascendant, plays a strong role in her chart. It is sextile her Venus in Taurus and trine her Moon. Since Venus is the leading planet of a Bowl Pattern, it has an important role to play, probably contributing to her wonderful four octave spanning voice and why it is her singing Cyndi is most noted for. Uranus is located in her fifth house along with her Sun, Mars and Mercury (though Mercury hovers on the cusp of the sixth house). Her creative gifts and ability to bring a childlike joy to her performances, both as a singer and actress, show the fifth house influence. Uranus adds the need to keep seeking new and different ways to express those gifts. 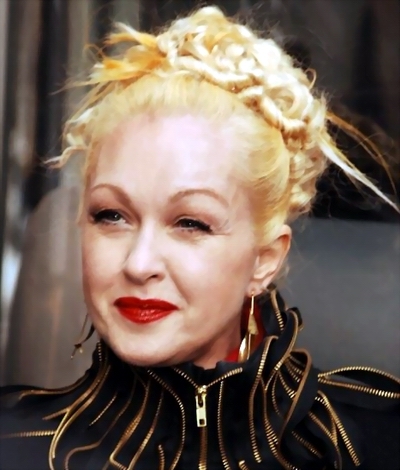 Cyndi also has her Saturn in Libra closely conjunct Neptune in Libra and underwent her second Saturn Return last year. Because her natal Venus is inconjunct the Saturn-Neptune conjunction, my guess is she has been seriously reevaluating her public image. The downside to being a celebrity is every gaffe you make tends to be revealed in a very public way. There were photos of her with an inflamed face due to a bad reaction to some type of facial treatment. She also has her Mercury in Cancer square Saturn-Neptune in Libra. Almost everyone who has a successful career in the dramatic arts has a major aspect between a personal planet and Neptune. Those I know with Saturn conjoined Neptune natally have been very good at working hard for their success as an artist, musician or acting on stage or screen. That harsh Uranus-Pluto square is taking one last shot at Cyndi’s Sun-Mars in Cancer now. She got hit hard by this one in August 2010 when her Sun completed a Grand Cross with Saturn in Libra, Uranus in Aries and Pluto in Capricorn. In the fall of that year, she once again demonstrated her true colors by strongly supporting the gay and lesbian community plus producing a blues album called “Memphis Blues”. On her, 57 years looks pretty darn good! Cyndi’s chart is an excellent example of why it’s important to look beyond the surface shown by the Ascendant. Like many of us, the lighthearted glitter of her public persona is backed up by a deep, complex personality with a big heart and a dedication to helping others learn to reveal their true colors. What a gal! Secret has it that all the cool kids have Cancer Sun’s and Aqua Rises, but some are even cooler and more superb with their Scorpio Moons. Yes indeed! 😀 Love Cyndi’s sense of comic timing but most of all love her depth & heart. Miss you . . . please stop by again. Glad you enjoyed this, Joe! I see her as multifaceted and get a kick out of seeing her pop up in my favorite TV shows once in awhile. 😀 Did you see the first movie she made w/Jeff Goldblum (who also has a 29 Libra Sun!! ), “Vibes”? It came out in the eighties and did far better in Australia than the US. I loved it. It was loads of fun. Thanks for saying that about Cancer Sun/Aquarius Rising, Pixie. You gave me a better day. (That’s me, too.) Hard to coalesce that combo sometimes. What I’ve noticed about Aquarius rising are 1) the high arching brows and 2) a strange hairline at the nape of the neck. Also showing up sometimes is a mole in the nose/upper lip area. I’ve always been a fan of Cyndi’s. Girls Just Wanna Have Fun is a classic. Double that interest with Uranus conj. Sun. 🙂 Big time! I have to agree with your comment here Diane. I hazard to think what a bore I would be without that Aqua rise, as I am very much the hermit as it is. Huh – ever since I was a teenager, I saw her birthdate as June 20, the same day as mine. It always stuck with me that I shared a birthday with her, now all over the internet it shows June 22, oh well, she still seems more gemini to me. I can’t begin to tell you how many times I thought I knew a celebrity’s birth date only to find out I was wrong. Many times that is due to wrong dates floating around. 😦 Frustrating, isn’t it?